It’s that time of year when a hike in the woods requires careful scrutiny of the trail ahead, when a momentary lapse of concentration can result in a spider web enveloping your face and head. This fall’s spider crop seems especially plentiful, with delicate webs collecting dew in the early mornings and glistening in the farm fields as we drive by on the way to school. Our new deck seems to be a favorite gathering spot as well, and this spider has spent the past week collecting brown marmorated stinkbugs, so I’ve been careful to not disturb her when I sweep leaves off the steps. 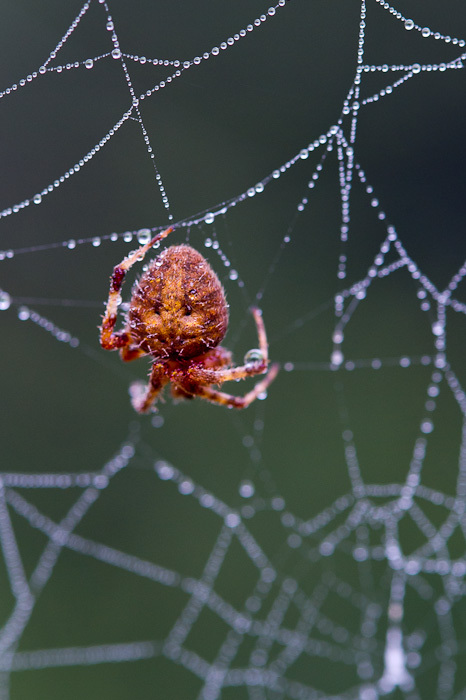 Today, I noticed her web had some damage, perhaps from a tough old stinkbug fighting its way out, but the strands still looked beautiful drenched in the morning mist. I really like this shot. Great time of the year for a spider. 🙂 The web with the dew on it is nice too. Great focus on the spider and web! I don’t like them, but I do like to see macro photos! Now that is AWESOME! I love spider’s webs in the morning before the dew dries. Very nice – the dew highlights the web and the spider beautifully.